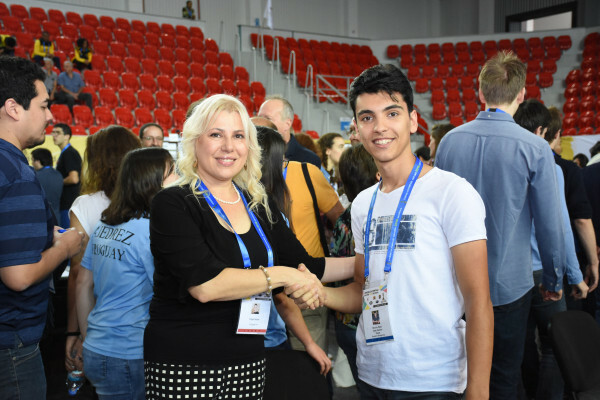 The Batumi Organizers of the 43rd Chess Olympiad awarded the Brilliancy Prizes for Round 4. 24.Ng6+! hxg6 25.hxg6+ Kg8 26.g3 Qe6 27.Qh2 Bh3 28.Qxh3 and Black resigned. In the Open section, Rijad Burovic (of Bosnia & Herzegovina) is the winner. 17.Bxf7+! Kxf7 18.Ng5+ Ke7 19.Qc4 Rf8 20.Be3 Qb8 21.Bc5+ Nxc5 22.Qxc5+ Ke8 23.Nb5 Rf6 24.Qc4 Ke7 25.g4 b6 26.Nxh7 Qg8 27.Qxg8 Rxg8 28.Nxf6 and Black resigned. Official Media Team - Cheers & Chess!